Cashew milk is my favorite of all milk (now I can say it considering I have tried 6 different kinds of milk including cow's milk, which, of course, is for calves! And I am excluding mother's milk because I really don't remember how it tastes anymore and I don't have a plan of having some as an adult...lol). Anyway, cashew milk is the easiest and quickest to make...tastiest too, for me at least. You have to try it yourself to validate my claim. We have been having cashew, almond, and soya bean milk coffee alternately since we have become vegans...and cashew milk is on the top list! Expenses-wise? Around similar to the commercial milk available in the market. We are currently paying Rs. 570 to 600 per kilo. A hundred or two more is nothing if it's for the mother cows and their calves. We really don't mind! So here's how to make it. 1. 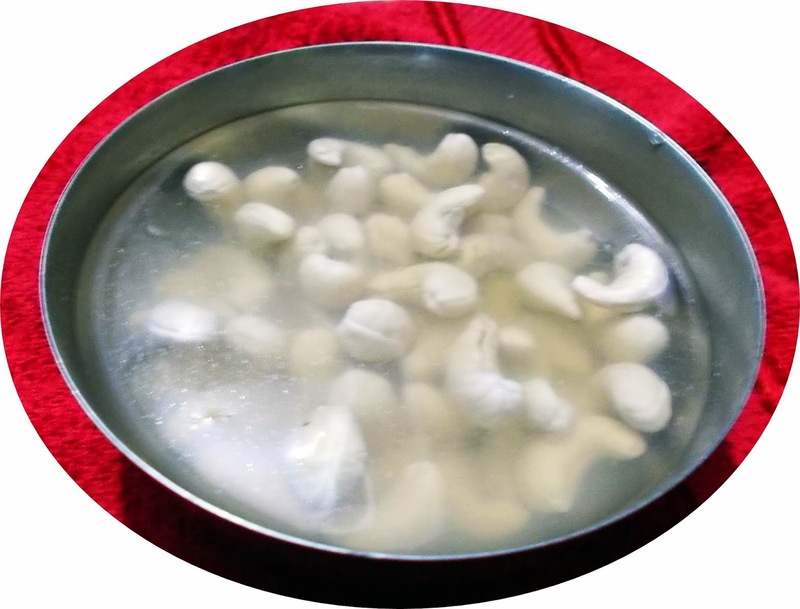 Soak 50 or more cashews depending on how much milk you want for 6 or more hours, preferably in plain tap water or warm/boiled water, which is optional. I generally use 50 cashews for two people for three sessions and our coffee is much. Our mug is bigger than the usual cup. You can try a lesser quantity first to see the consistency yourself. 50 soaked cashews ready to be churned and made into milk. The cashew oil is what makes the water blurry. 2. Discard the water that was used for soaking. Using a mixer/blender, churn the soaked cashews with little water first, enough to break the cashews into little pieces for a full minute churn. Then slowly add more water. It's generally 1:5 ratio (estimation). A glass of cashews requires 5 glasses of water. (I am using a six-blade liquidizer, the picture above though using a chutney jar (smallest jar), which I just tried out, gives a better result. It's done quickly, too. Just churn the soaked cashews twice without water, then slowly add a little bit of water in next 2 to 3 churning). 3. For final churn, add the rest of the water keeping notice that there's no little chunk of cashews left hiding at the neck of the jar or at the jar lid. Blend for about a minute more. 4. No need to sieve or strain. For 50 cashews I generate around 500-650 ml. of milk. Afterward, I add a little more water during the making of our coffee. Check milk consistency! Drink it fresh or keep for later use like coffee or baking. Cashew milk chocolate is also very tasty. Use a plain cocoa powder instead of the commercially available chocolate powder. Cocoa is always known to improve memory. Enjoy! 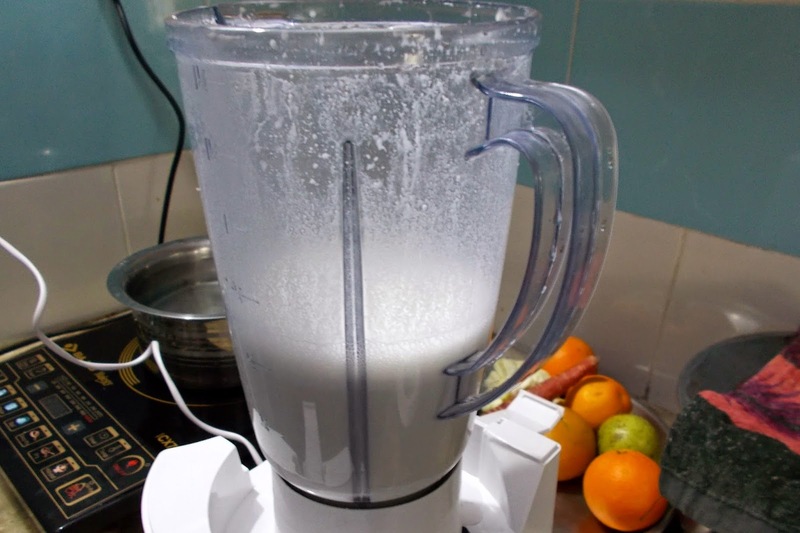 Just heat cashew milk, stir quite often and as much as possible never boil to avoid curdling. Generally, this only happens when the milk is a few hours older and not kept in the fridge. then add it to your coffee cup. Done! Important tip: Use a little, just about a finger tip, cashew milk cream or whatever is left at the sides of a bowl you use for boiling and apply it to your face or hand for a smoother and softer skin. You can even have a spoon of cashew milk itself and apply it to whichever part of your skin. It really works! ~Too much dilute lacks taste! So make sure it's not too thin nor too thick. Experiment on your own! ~We don't have a refrigerator so the quantity I make is for one day use. 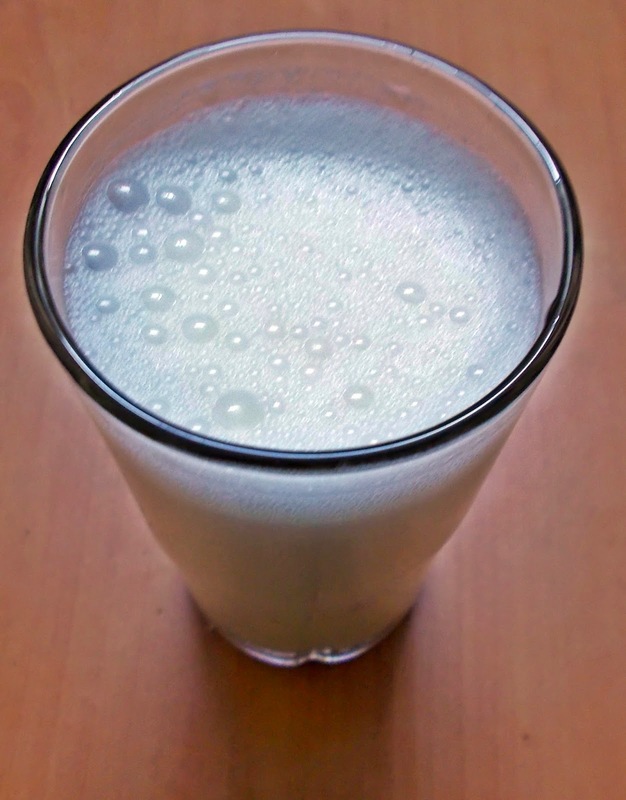 If you have a fridge then you can make more and just store the milk in the fridge. Many say it could last for 3 days. ~We make coffee and chocolate drink out of cashew milk. ~We tried tea with it. I made a tea decoction and heated the milk (no extra water this time) at the same time. When decoction was ready, I mixed it with the milk. Sugar was added, too! The result was not that satisfying though not bad. What was not at all likable is when I made the tea decoction with the milk itself. Undrinkable! ~Any idea how to make a memorable cashew milk tea? Let me know! I believe that if a child is introduced to this milk there is no way that he/she would even like the taste of cow's milk. And contrary to what we were made to believe by milk industries and advertisers, animal milk is THE most unhealthy milk you could ever drink yourself or give to your children. The purpose of milk, mother cow to her calf, and human mother to her baby is for growth. Cow's milk is never for humans and human milk is only for babies, not for adults. So just imagine if, after weaning, kids continue to drink cows' or other sources of animal milk (they are forced to, sometimes)! Humans are the only species who steal another species' milk just for taste...a taste that poses danger and expensive consequences.